A good flamenco tells a story. If that’s true, then Images: 20 years is a performance of legendary proportions. Choreographed and featuring Rafaela Carrasco, the piece covers Carrasco’s 20 years with the company from student to her current status as resident choreographer. Although each of the 5 chapters in this performance run chronologically, this is no literal retelling of events. Instead, Carrasco has created an interpretive movement album of her journey using symbolism, light and colour. Opening with Del Maestro (The Teacher) we see a band of mixed dancers all seated on stools performing a stern routine whilst dressed in a uniform of high waisted trousers, shirt and harness braces. Lead by the teacher Carrasco, it’s a strong start which loses it’s way in the lunar themed second chapter En La Oscuridad de la Luz (In the dark light) which for all it’s props – including individual floor lanterns – lacks the visual punch of Del Maestro. It’s a return to form in the third chapter Leyenda (Legend) where Carrasco appears in a white dress with a ruffled train so long it would put any bridezilla to shame. The band of women who join her embark on an equally as fierce flamenco display, the only confusion being the video projection of red squiggles in the background. Time for a plot twist for the fourth chapter Mirando al Sur (Looking South), where the furious footwork of the flamenco is felt on suitcase stages set in a train station. Here, the dancers up the ante, egging each other on in their solo sections as if street performers garnering a crowd. For the closing chapter, Las Quatro Esquinas (the Four Corners) the show is at its most traditional, with scarf swirling and elaborate costumes. It’s fitting, that the final solo be reserved for Carresco, who seems to write the climax of the story with her feet and spins. Images: 20 years is a masterclass in the traditional styles of flamenco. Where the visual and narrative experiments may not push many boundaries, the real pleasure is in the artistry of the performers and the authority of Carresco’s choreography. 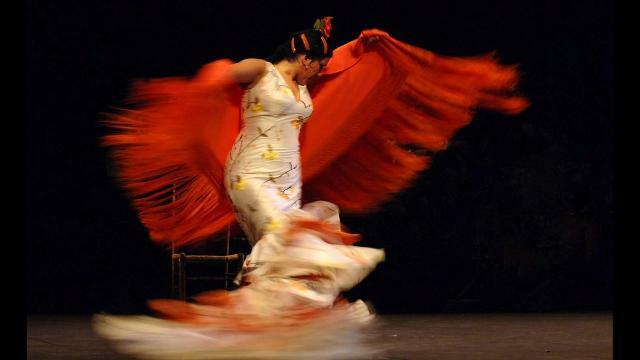 This was particularly potent in the solo performances where the passion, colour and power of flamenco shines through. Credit is not just reserved for the dancers, the brilliantly authentic musicians accentuate and interplay with the impressive rhythm making on stage, maintaining a vein of consistency in Carrasco’s at times capricious world. Nevertheless, it’s a tale worth telling. Reviewed at Sadler’s Wells 21 February 2015.